Tracy gained a BA(Hons) degree in Fine Art in 1986, qualified as a lecturer in Art in 1988 and later worked in Further and Higher Education for 12 years. She has been involved in teaching young adults and mature students in a range of artistic disciplines including printmaking, life drawing and visual studies. In 2006, Tracy decided to commit more of her time into producing her own artwork . She now works full time as an artist from a purpose-built studio in her home village of Arnside, Cumbria. The wonderful landscape of south Lakeland has proved to be a perfect source of inspiration for her work. 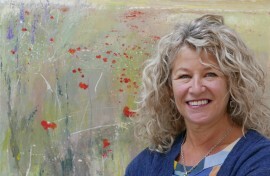 Her work is now exhibited extensively in galleries throughout Cumbria and the North West as well as around the U.K. Tracy has been a prize winner for the past 3 years in the Cumbria OPEN as well as being awarded first prize in 2009. Tracy’s contemporary paintings capture the spirit of the landscapes that inspire her. Her feelings and awareness of an environment are portrayed on canvas in work that expresses a strong connection and intriguing sense of place. The subjects are mostly places that she knows well and visits often. The intensity of observation, through painting and drawing in situ, is captured in the ensuing studio work. This first hand response gives an immediacy and spontaneity to her work. Tracy embraces an extensive range of media in her paintings, sometimes including collaged materials. Her printmaking combines original mono printing techniques with painterly elements. The resulting work reflects a distinctively individual style of intuitive semi-abstract work. In this section you will also find information about the artist’s studio, printmaking, and her cv.